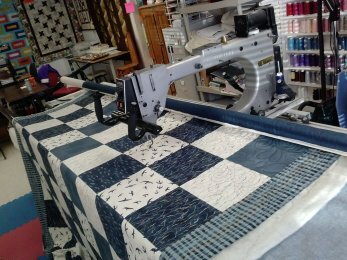 Quilt Patch Fabrics is proud to offer a full range of Quilting Services including Longarm Quilting and Binding. If you have any loose pieces on your quilt top they may fold over during quilting. If this is not the desired effect please make sure all edges are sewn securely to the quilt top. We are not responsible for unsecured pieces on your quilt top. Please wait until after quilting to add embellishments such as buttons. Remember, quilters need enough extra backing to mount onto the longarm machine. Please make sure your backing fabric is at least 3"-4” larger than the quilt top on every side. For example: If your quilt top is 54” x 72” the backing fabric should be 62” x 80".